Company: Can be kept in community type aquariums with other fish that are somewhat aggressive. Aquarium setup: Tramitichromis intermedius should be kept in an aquarium with plenty of hiding places and a sandy bottom substrate. This species prefers to be kept in a planted aquarium. 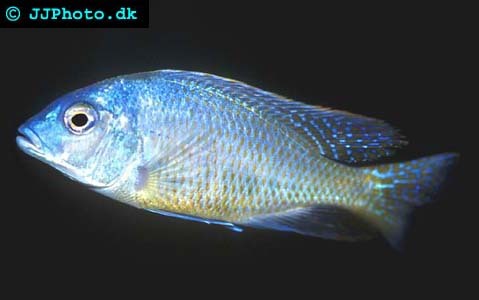 Feeding: Tramitichromis intermedius prefers live and frozen food but can usually be trained to accept pellets. Breeding: Tramitichromis intermedius are moutbrooders. The male builds a spawning crater on a sandy bottom. He then tries to lure a female to the crater where she lays her egg that is then fertiliazed by the male. The female then carries the eggs in her mouth until they hatch. She usually carries the hatched fry for a period. The brooding females can be isolated for better breeding result.